explicitly despised Andy Warhol as a consumerist Capitalist sell-out. an Andy Warhol show soon to open at the National Arts Club? and Dietmar Kirves (Berlin) guiding the Eastern Front. are the very antithesis of everything Boris fought for. stood for but have now made their most egregious move yet. has been slated to curate the show. but contributed to the denigration of art and the human spirit. even evil purveyor of decadence and apathy. of the Nazi filmmaker Leni Reifenstahl. the Andy Warhol exhibit by BLAF be halted immediately. Boris Lurie, who died in 2008, was a Holocaust surivor and one of the founders of a radical art protest movement known as ► NO!art. I’ve ► blogged about him before. 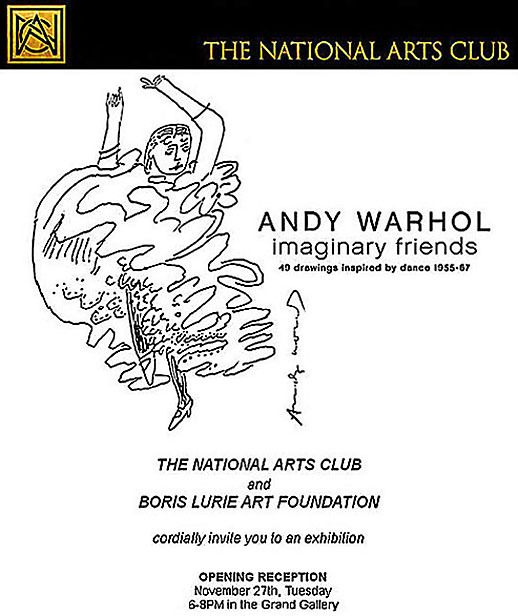 His close friends ► Clayton Patterson and ► Dietmar Kirves are sending around a petition to halt an exhibition of Warhol works that opened last week at the National Arts Club in New York, because it is being underwritten by the Boris Lurie Art Foundation. They note that Lurie “explicitly despised Andy Warhol as a consumerist capitalist sell-out.” The exhibition is scheduled to run through Dec. 28. Boris Lurie, who died in 2008, was a Holocaust surivor and one of the founders of a radical art protest movement known as ► NO!art. I’ve ► blogged about him before. His close friends Clayton Patterson and Dietmar Kirves are sending around a petition to halt an exhibition of Warhol works that opened last week at the National Arts Club in New York, because it is being underwritten by the Boris Lurie Art Foundation. They note that Lurie “explicitly despised Andy Warhol as a consumerist capitalist sell-out.” The exhibition is scheduled to run through Dec. 28. Clayton Patterson wrote to James Cavello on November 22, 2012: James Cavello curator of the Warhol/Lurie exhibition at the "National Arts Club", James no question that you are a little bit of a rascal. Dietmar Kirves wrote to Clayton Patterson on November 22, 2012: dear clayton, life is life. when we are dead we can't control what they do with our art works. you know boris intention was to bring disruption with NO!art in the art world against cultural manipulation. but now all the money makers and riches like gertrude manipulate it in her own sense with boris works. all curators engaged by gertrude look for money and the profit and success. the boris lurie art foundation [blaf] try out to make more money with boris works which he leaves behind. you know how dogs blaf when you meet them.